I've created a downloadable Minecraft map that implements "Swampcore" (older blog post about Swampcore). It's a superflat swamp biome preset with a 24/7 thunderstorm, making for an extremely hostile map where you have to scratch and claw your way into having so much as a simple dirt shack to call "home". It runs on vanilla Minecraft (no mods or anything needed) and was created on Minecraft v1.8.3, but will probably work on later versions too. The superflat swamp includes lakes and lava lakes, oak trees, vines, sugar canes, mushrooms and tall grass. The water lakes can sometimes spawn with sand or clay, and the lava lakes spawn with stone around them. The stone can occasionally be an ore block instead (such as iron or redstone). Diamonds are able to spawn around the lava lakes as well (world surface is at Y=11) but are extraordinarily rare. 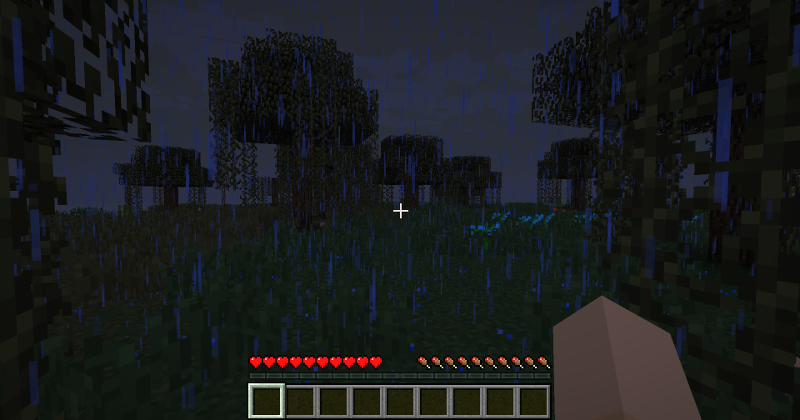 There is a 24/7 thunderstorm which keeps the sky dark and prevents zombies and skeletons from burning up during the day, and even allows for hostile mobs to spawn during the day. Players will frequently get killed while just trying to build a cheap dirt shack to live in. The only stone on the map is around lava lakes, so players will need to loot a lava lake in order to build a furnace or stone tools. The main source of coal will be from burning wood logs in a furnace, as coal ore will be extremely rare. Zombies can rarely drop iron ingots when killed, or players can try to find iron ore around lava lakes. The nether portal can be built and activated, but since diamonds are practically nonexistent players would have to build a mould for a portal and pour lava and water in using buckets to slowly build the frame. Since gravel is extremely hard to find (impossible? ), no Flint & Steel, so players would have to use lava with wood planks to set a fire near the portal and wait for it to spread into the frame and activate it (pretty tedious). With the presence of sugar canes and access to the nether, splash potions of weakness and golden apples can be crafted and a zombie villager could be healed, so players can build their own NPC village. With villagers players could trade for diamond gear and lots of other items that are otherwise impossible to get on this world. In short, it's entirely possible to get to the late game on this world (the main thing missing is access to the End Dimension, since no strongholds exist, but that's probably for the better in a multiplayer server anyway). It's just very, very difficult. Even when you manage to secure a safe perimeter, venturing outside to get any more resources or loot more lava lakes remains just as dangerous as on day one. This map is especially designed to be played on multiplayer survival (SMP). 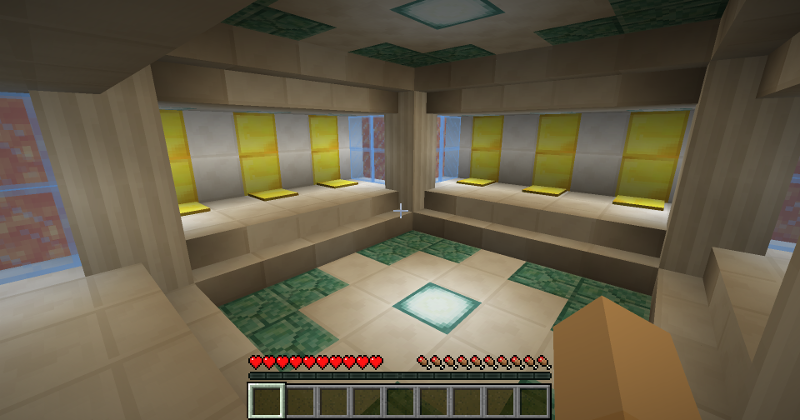 All new players who join the server (and players who die without having a bed to reset their spawn point) will be placed in the spawn room, which is a radially symmetrical room with 12 golden pressure plates along the walls. Each pressure plate would teleport the player into an unpredictable place in the swamp around a large radius (each destination is about 2,000 blocks away from the next). The spawn room that new players will find themselves in. The idea is to distribute the players around the world. If you die and reappear in the spawn room, it's difficult to find your way back to where you left off because it's hard to know exactly which pressure plate you used the last time. Where a player might end up when stepping on a pressure plate. Place it in your .minecraft/saves folder for single player or use it as your world on multiplayer. I moved the world spawn point to be at coordinate 0,0 on the X/Z plane. A large 40x40 floating platform is centered on 0,250,0 (250 blocks in the air) which encompasses the spawn region for players on multiplayer. All newly joining players land on this platform at first before being teleported into the spawn room. The spawn room is around 0,4,0 inside the bedrock layers beneath the world spawn point. Command blocks that enforce the 24/7 thunderstorm and teleport players into the spawn room are around 0,1,0 beneath the spawn room, using a hopper clock. Players in creative mode are allowed to approach the 40x40 spawn platform at the top of the world without being teleported to the spawn room. This is reserved for any maintenance tasks, etc., by server operators.